A well organized house gives the owner confidence and peace of mind. A shelf can be a powerful tool when decorating a house. Actually modern MDF shelves can transform the entire look or mood of a room. If you want to draw attention to a particular part of the room, you can use decorative and modern MDF shelves. The MDF shelves will not only create a focal point in a room but also enhance the beauty of a house. They have different designs and colors that make the entire room to stand out. 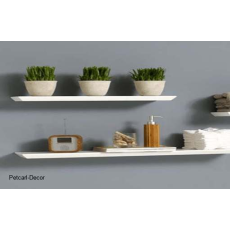 It is a better way to upgrade the look of your kitchen, living room and bedroom with modern floating shelves. By incorporating these shelves into your house or office, you can proudly display family pictures, souvenir toys and other decorative items in the house. Need to increase storage capacity in your house? Petcarl Décor offers a variety of different storage options making it easy for you to find the right set of shelves that suit your style.